San Diego State University will hold a press conference Wednesday to announce what it called the largest philanthropic gift in the history of the university — likely topping $20 million. SDSU President Elliot Hirshman and the donor will speak at 3:30 p.m. outside Student Services East (just north of the Student Union), said a statement. No other details were released on the size of the donation or its source. The largest gift to the university until now has been $20 million by the late Conrad Prebys, which endowed scholarships for about 150 students a year. 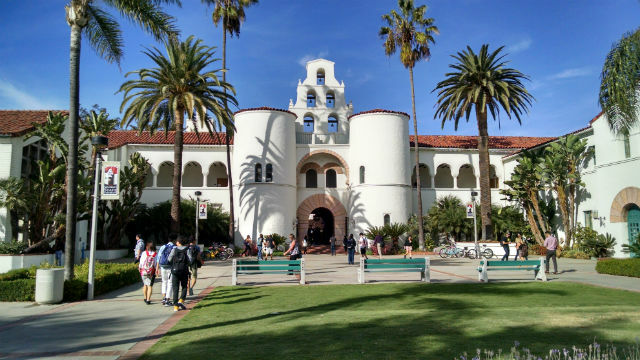 In July, SDSU reported that it was “rapidly approaching” the $750 million goal of its first comprehensive fundraising effort, called the Campaign for SDSU. Launched in July 2007, the campaign hit its initial goal of $500 million in September 2014, SDSU said. In 2016, the university was one of only 20 in the country to receive a CASE award for Sustained Excellence in Educational Fundraising. Other awardees include the University of California, Berkeley, the University of North Carolina, Chapel Hill, the University of Virginia and Stanford University. Two weeks ago, UC San Diego reported receiving $213 million in gifts in the past fiscal year, a record for donations and a 20 percent increase from the previous year, said the U-T. In January, Bloomberg News reported that 2015 saw U.S. colleges raise a record $40.3 billion from donors. “In the year through June 30, Stanford led with $1.63 billion, a record for an individual school, according to a survey released … by the New York-based Council for Aid to Education, which tracks university giving. Harvard ranked second with $1.1 billion,” Bloomberg said.